A pilot training mission at an eastern Iowa airport Wednesday had some people wondering if President Obama was in the state. It turns out the low 747 that resembles Air Force One was simply a pilot practicing takeoffs and landings. The plane from Offutt Air Force Base in Nebraska was circling the Eastern Iowa Airport in Cedar Rapids. Lieutenant Colonel Sean Murphy is Chief of Training of the First Airborne Command and Control at Offutt Air Force Base. He says the plane was drawing attention because the Eastern Iowa Airport is rarely used as a landing spot for the plane. “We have a variety of transition bases that we go to and Cedar Rapids is one of the airports that we can fly our airplane at…the runway is long enough and wide enough and has got the facilities that we need,” Murphy said. 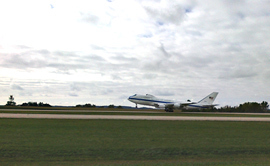 The plane in Cedar Rapids is a militarized version of a 747 called an E-4-B. Just as with Air Force One, the words “United States of America” are painted on the side. However, the E-4-B contains a different shade of blue and different color pattern. “Our mission is to provide the President and the Secretary of Defense with a survivable command center for directing the United States forces during conditions of peace and war and we insure that the federal government can maintain continuity during military, national and natural emergencies,” Murphy said. There are only four 747 E4Bs in the Air Force fleet. They’re designed to serve as an airborne operations center for the president and secretary of defense during a national emergency.